Whenever 2001: A Space Odyssey is mentioned, the award-winning 1968 Stanley Kubrick is more often than not what jumps to mind. Equally, if not more so, as impressive is the novel by Arthur C. Clarke. What is interesting about the novel and movie adaption is that they were written side-by-side after Kubrick approached Clarke to ask for, in his words “the proverbial good science fiction movie”. Undeniably, Clarke delivered. Readers are whisked back millions of years ago to when humans were no more than apes foraging on the barren land. With little means for food and under constant threat from predators, they don’t show much promise as a species. Then one day an artificial, alien monolith appears and begins testing the human predecessors for intelligence. Through a series of tests the apes receive a spark of intelligence, which turns out to be what sets them apart from the other wildlife and starts advancing them on to become what is today the human species, or homo sapiens. Fast forward to the present day and mankind have just discovered a similar relict on the moon. I don’t want to give too much away, but mankind gather a group of the greatest astronauts together and send them far off for Jupiter. Yet the men are not alone, as the artificially intelligent super computer HAL accompanies them, controlling and monitoring the ship. So far we have a group of astronauts, thousands upon thousands of miles from home in pursuit of the alien accompanied by the free-thinking super computer HAL, what could go wrong? 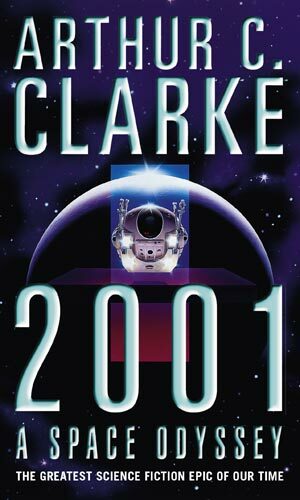 The thing that shone about Clarke’s writing is his ability to both showcase his research and knowledge of subjects such as space-travel in an interesting light while advancing the plot and creating a captivating page turner. You feel both miles away in the middle of this wondrous solar system, but also trapped in the modern, albeit slightly monotonous, Discovery. You are pondering over the mysteries of the universe and assessing the single worth of a life, yet you are rooting over single people (or machines) simultaneously. Now 2001: A Space Odyssey is in no means a fact book, but it does an excellent – perhaps even unparalleled when it comes so science-fiction – job in sparking interest in what is, or may be, out there.